Wow, hair is already growing out of he new follicles - Congrats! Post updates so we can see how it goes? How many follicles did you recieve there? That looks like it would be incredibly itchy. Seems ok. You posted this photo a long time ago. Can you share your recent photographs so that we can check what results you've got? Had my grafts probably 30 years ago, but I might as well clarify a few things posted here. The hairs growing out of the follicles are from the donor area, not new hairs. 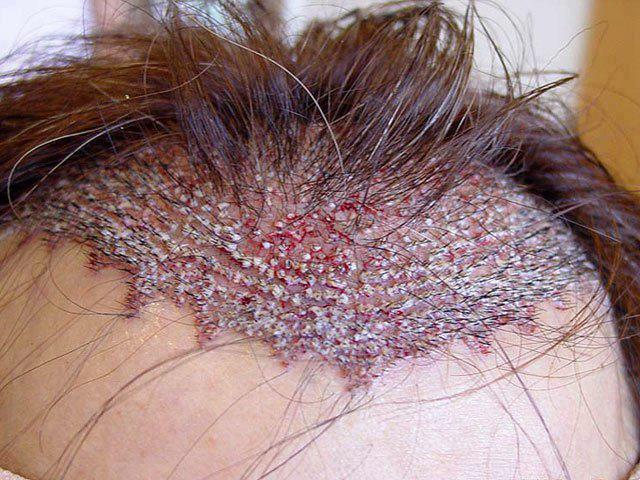 The white ragged skin is the cut up sections of donor tissue that is planted into cuts in the scalp. These go away as dead skin after a few weeks, but the base that is plugged into the skin stay alive. It is supposed to take 3 - 6 months for the original donor shafts to shed, and the new hairs grow back. For me my grafted hairs still grow at full vigor and have retained their black colour to this day.